This weekend marks Hungry Sofia’s second birthday. 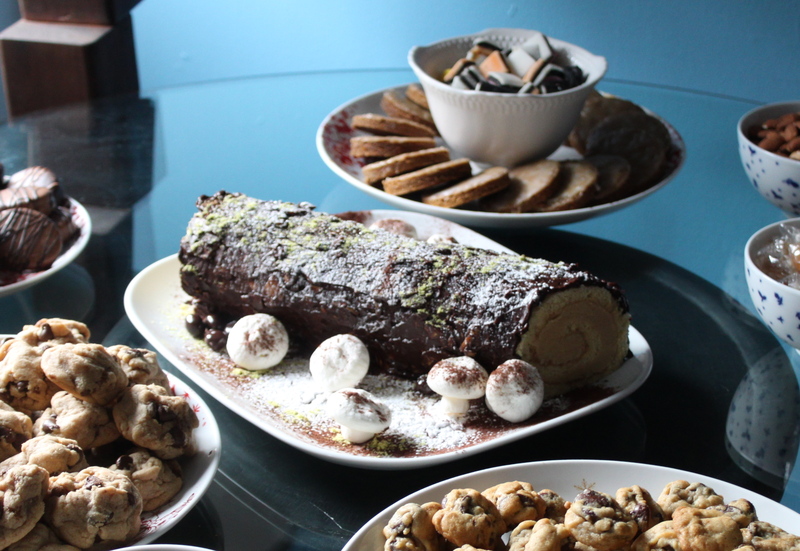 In that first post, I talked about wanting to eat my Christmas tree (still do) and mentioned a bûche de noël but included no recipes or pictures. Two years later and closing in 300 posts, I thought it was time for the bûche to have its closeup. With friends coming over once again before going there separate ways for the holidays, I had the perfect excuse to make my site a birthday cake. Working furiously the night before, I baked off two kind of cookies, made a batch of coquitos navideños (to be posted later), prepped the buttercream for the next day, and set my mushroom caps and stems in a barely warm oven to set. While the Christmas carols I had on the spinnet (okay iTunes) became mildly menacing around 2 in the morning, I thought I had enough done to sleep a few hours, get in my Saturday run, and finish the cake before anyone got there. Fortunately, the most forgiving friends came first because despite my best efforts, I couldn’t get my run in, needed help rolling and baking the last of the cookies, and was still finishing the cake when they arrived. Trying to recreate the light snow described in the recipe, I fussed with it until I reached a blizzard warning then stopped. Down to the wire as always but luckily just in time to celebrate. Of course I know that “blogaversary” is the more traditional term (if that can be applied yet to the blogosphere) but I like the thought of Hungry Sofia as a bratty two-year old. Putting up my first post and not sure if I would have the follow through to write a second or third, I was all baby fat the first year. Needing constant attention, I went off in a million directions at once, no expectations and just happy to be fed. Toddling around the last few months, I’ve slowly found my legs, tried new things, visited other sites, gotten some amazing mentions, went live action here, and got some great feedback from all of you. I’m a little more sure of what I like (and don’t) but am still hungry for more. Adapted from Tartine by Elisabeth Prueitt and Chad Robertson. Though there are a lot of steps, Prueitt and Robertson offer options for working advance. The buttercream can be refrigerated for 5 days or frozen up to 1 month. Before using, bring to room temperature and beat it with a mixer on high speed. It will separate at first but come back together. The cake can can be assembled and refrigerated for a few days but should be frosted and decorated the day it is served. Pour about 2 inches of water into a saucepan or double boiler. Bring to to a simmer over medium heat. In the stainless-steel bowl of a stand mixer, whisk together the sugar, egg whites, and salt then place over the saucepan and continue to whisk until hot to the touch (120º F), about 3-5 minutes. Remove the bowl and place on a mixer stand fitted with the whisk attachment. Mix on high speed until it holds stiff, glossy peaks, about 5 to 7 minutes. Reduce speed to medium-high and add the butter 1 tablespoon at a time, beating well after each addition. The cream will become satiny and smooth. Reduce the speed to low and add the brewed espresso, increasing the speed to medium until well incorporated. Set aside until needed or store for later use. Preheat the oven to 175º F. Line a baking sheet with a silpat or parchment paper and set aside. Combine the confectioner’s sugar and flour in a small bowl and set aside. In a stand mixer fitted with the whisk attachment, beat the egg whites, cream of tarter and a pinch of salt on medium speed until they hold soft peaks. Gradually add granulated sugar and continue to beat until it forms stiff peaks. Using a rubber spatula, gently fold the flour-confectioner’s sugar mixture into the beaten egg whites all at once. Work quickly, careful not to deflate the meringue. Fill a pastry bag fitted with a plain tip (about ½” or No. 6 or 7) with the meringue. To pipe the mushroom caps, hold bag horizontally to baking sheet and apply even pressure to press out desired size then pull bag away quickly. If you leave a tail, smooth it out with a wet finger. To pipe the mushroom stems, hold bag horizontally to baking sheet and make a kiss shape, pulling up directly to form a tail. If you’re not happy with the shapes, scoop meringue back into the bag and try again. Place the meringues in the preheated oven with a wooden spoon to keep the door ajar. Bake for at least 4 hours, rotating pans and checking regularly. If the meringues begin to color, reduce the oven temperature by 25 degrees. When the mushrooms are ready, remove from the oven and let cool completely. If they feel soft when they come right out of the oven, they will firm up as they cool. They can be stored at room temperature for up to a few weeks. Brew espresso and dissolve the sugar in the hot coffee. Set aside to cool. Place chocolate in a small heatproof bowl. Heat the cream in a small saucepan to just under a boil. Pour the heated cream over the chocolate and allow to sit undisturbed a couple of minutes. Using a small rubber spatula or spoon start agitating the chocolate from the center, making slightly larger circles as you stir together the chocolate and cream. Stir until the chocolate melts and becomes smooth and shiny. Gently stir in the almonds. Set aside in a cool place or refrigerate up to 15 minutes so that it thickens slightly. If the mixture becomes too thick, set it over a pot of simmering water and stir with a spoon until it reaches a spreadable consistency. Using a food processor or coffee grinder, process the pistachios to a powder. Place the cooled cake lined in parchment paper on a counter or rack. Using a pastry brush, moisten the cake with the coffee syrup. Spread an even layer of buttercream over the cake leaving a 1” border on both long ends. Starting with the long end closest to you, roll the cake using the parchment paper to help lift and roll the cake tightly and evenly. * Wrap the cake in parchment paper or plastic wrap, seam side down. 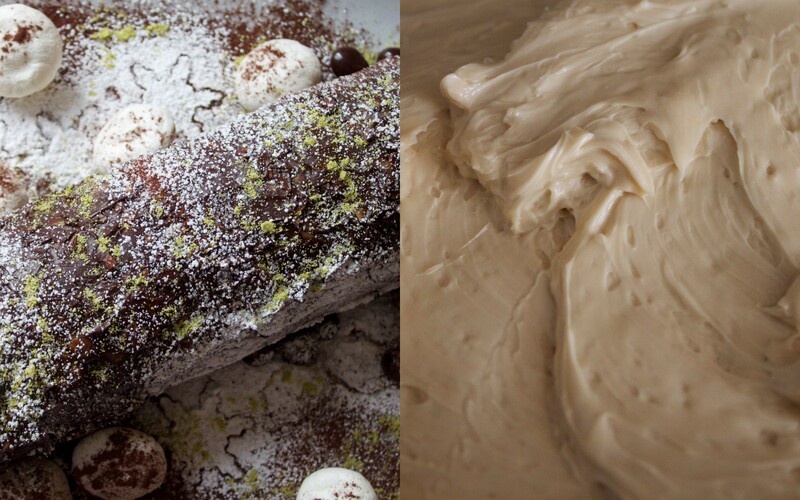 Refrigerate until the buttercream is firm, about 2 hours. Set the cake on the counter seam side down. Cut a slice off each end on the diagonal to even out the ends. Using an offset spatula, ice the top of the cake with the almond “bark” and along the sides. Transfer the cake to a serving platter. To assemble the mushrooms, use a small sharp knife to open up a tiny hole in the bottom of each cap. Dip the mushroom stems into the remaining chocolate bark and attach to the mushroom caps. Place the mushroom around the buche. 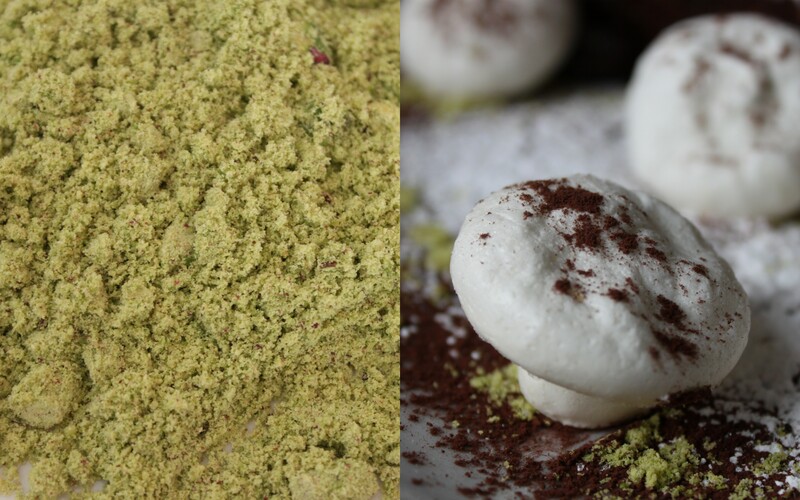 Sprinkle with cocoa powder to make the “ground”, pistachio “moss”, and confectioner’s sugar for “snow”. To toast almonds, preheat oven to 350º. Spread almonds in an even layer on baking sheet and toast till lightly golden, 5-7 minutes. Cool on a rack and set aside. *I removed the cake from the baking pan lined in the same parchment paper I’d used for baking it. It makes the transfer from pan to counter or freezer easier and gives you the most control when you’re rolling the cake. Preheat the oven to 325 degrees. Line the bottom of a 12×17-inch jelly-roll pan with parchment paper cut to fit it exactly. Do not grease the sides. Sift together the flour, baking powder, salt and all but 3 tablespoons of the sugar in a large mixing bowl. In a separate bowl, whisk together the oil, egg yolks, water, vanilla, and lemon zest. Make a well in the flour and add the yolk mixture. Whisk thoroughly until smooth, about one minute. In a stand mixer fitted with the whisk attachment, beat the egg whites on medium speed until frothy. Add the cream of tarter and pinch of salt and continue to beat on medium speed until they hold soft peaks. Gradually add the remaining 3 tablespoon of sugar and continue to beat until it hold stiff, shiny peaks. Blend about 1/3 of the whites into the yolk mixture to lighten the batter. Gently fold in the remaining whites until just combined. Pour into the prepared pan and smooth the top. Bake in the preheated oven until just set to the touch, 20-30 minutes. Allow to cool in the pan on a rack, To unmold, run a knife along the sides of the pan to loosen the cake. To unmold, use the parchment paper to gently lift the cake out of the pan. 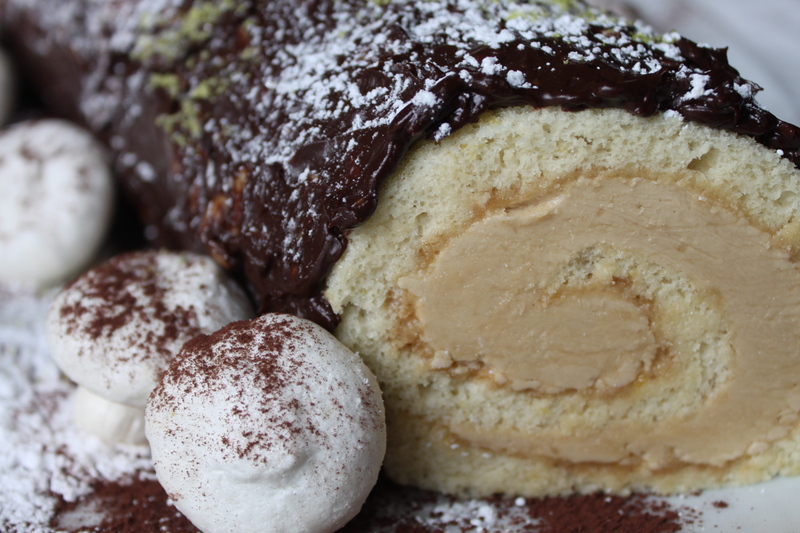 Use immediately to make the bûche de noël. The cake can also be wrapped and stored in the refrigerator for 3 days or in the freezer for 1 month. Bring to room temperature before using. Your blog is wonderful! I can’t wait to see what you will grow into! HAPPY BLOGBIRTHDAY! Oh! And happy blog-o-birthday!!! Congrats! Sofia, descobri seu blog e amei! Parabéns pelo seu trabalho, pelas suas postagens. Sigo você com muita curiosidade e admiração.